PACIFIC SCOOP led the way in reporting and backgrounding a horrendous video exposing - yet again - Indonesian human rights atrocities against West Papuans. Here, Scoop's duty editor Rory MacKinnon analyses in his column Deadline the week's events in an indictment of Foreign Minister Murray McCully's inept response, lack of media coverage and a pattern of failure by the New Zealand governnent over human rights in East Timor and West Papua. Within hours the horrific footage made the headlines of Al-Jazeera, the BBC, CNN and the Sydney Morning Herald, while Amnesty International and other NGOs demanded an independent investigation by Indonesia’s National Human Rights Commission. Meanwhile, coverage here in the Shire was practically non-existent, other than here at Pacific Scoop and the equally tiny newsroom at Radio New Zealand International. Even MFAT didn’t bother to brief our foreign minister Murray McCully on the video – despite his going on a two-day trip to Indonesia the very next day. It might not have been evident in my reporting, but I could sympathise with McCully’s situation. Imagine the midnight phone call; the gut-churning realisation that the complex system of memos and digests and reminders that diplomacy depends on has utterly failed you; knowing that the ‘Friendship Council’ you launched just hours ago will come across to many as a cruel joke and the knowledge that tomorrow morning you will have to walk back into the meeting room and make a very lonely choice about New Zealand’s foreign policy. But McCully’s choice was a poor and predictable one, and that’s where my sympathy ends. McCully allowed his counterpart Dr Marty Natalegawa to feed him the usual canned response: the Indonesian government took such incidents “very seriously”, their military had already begun an internal investigation and so on and so on. But as any MFAT official worth his salt would know, the promise of an in internal investigation means absolutely nothing in the context of human rights abuse in Indonesia. Christ, we don’t even trust internal investigations here. But the notion of an Indonesian internal investigation is especially laughable, because we’ve played this game so many times before. 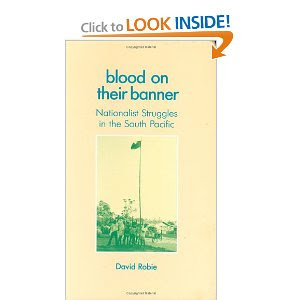 Consider the case of the Balibo Five, a group of journalists killed during the 1975 invasion of East Timor – a group which incidentally included a Kiwi cameraman, Gary Cunningham, and a sixth Australian reporter, Roger East, who was killed two months later while investigating their deaths. In the 35 years since the Indonesian government has refused point-blank to mount any kind of inquiry, even refusing to cooperate with a 1997 Australian coroner’s inquest which implicated Indonesian special forces commander Yunus Yosfiah in the shootings. Yet despite the court’s findings and pressure directly from the UN, the Serious Crimes Unit in Dili refused to press charges, making extradition impossible. [It should also be noted that despite literally decades of petitions from Cunningham’s own family, no New Zealand government has ever demanded Yosfiah’s arrest either.] Today Yusfiah is the most highly-decorated member of Indonesia’s army, a former Minister of Information and a senior politician, while the foreign journalists he murdered lie in a mass grave in Jakarta. 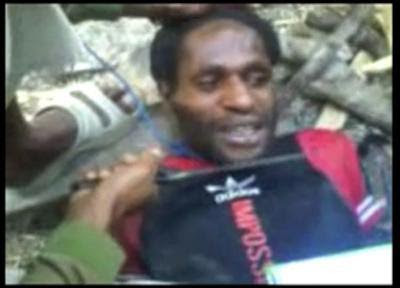 If there was no justice for them, what hope is there for two unmourned villagers in the backblocks of West Papua? Consider also the Santa Cruz massacre of 1991, when Indonesian soldiers gunned down a Timorese funeral procession for a young man killed by militia. 271 killed, 278 wounded and a further 270 ‘disappeared’ – and again a New Zealander died in the crosshairs; this time the 21-year-old Kamal Bamadhaj. The response from both the New Zealand and Indonesian governments is farcically familiar, as summarised in human rights activist Maire Leadbeater’s secret history Negligent Neighbour: New Zealand’s Complicity in the Invasion and Occupation of Timor-Leste. It was clear that a cover-up was under way. The Indonesian Department of Foreign Affairs sent a preliminary response to the New Zealand Embassy that referred to Kamal’s “accidental death” and insinuated that he should not have been taking part in the demonstration. The official inquiry would conduct a thorough and comprehensive investigation but would also look into Kamal’s ‘activities in Dili during his stay there as well as the nature of his presence among the demonstrators in the incident leading to his death. Publicly, New Zealand diplomats stressed that they were vigorously pressing for a full explanation of Kamal’s death but the cabled reports suggest the diplomats were resigned to being fobbed off. The Indonesian government did indeed mount an internal investigation, forming a “Council of Military Honour” and court-martialling nine soldiers and one policeman in 1992. But as Timor-Leste’s president Xanana Gusmao noted, none of those convicted had ordered the shooting, buried the bodies or participated in the attempted cover-up, and neither the report from the National Commission of Inquiry nor the Council of Military Honour’s report have ever been released in full. This was a massacre of literally hundreds of people, caught on camera by foreign journalists. Again, what hope is there for the two men in Monday’s footage? Yet there is hope: McCully and his prime minister can publicly insist on a genuinely independent investigation. They can join calls in the Pacific Islands Forum for a fact-finding mission into human rights violations in West Papua. They can withdraw their joint training exercises with Indonesian law enforcement until the law is actually enforced in the region. There are all sorts of things they can do to give Monday’s victims and the people of West Papua hope. But trusting the butchers in Indonesia’s military to sort it out among themselves is not one of them. Rory MacKinnon is Scoop’s duty editor and political reporter. He also writes about journalism and social issues at www.mediadarlings.net. During the Vietnam war, anthropologists in northern Thailand and Laos were unsuspectingly passing on information about the Hill Tribes that helped the US war effort. Over a longer time period, banks of audio equipment in laboratories at the East-West Center in Hawaii helped students learn hundreds of languages, many spoken by people in politically unstable areas of interest to American Intelligence. Further back, prestigious colleges at Oxford and Cambridge offered scholarships and training for Britain's Third World Elite, and Harvard produced a worldwide generation of right-thinking economists and businessmen, who we now see got it all wrong. Further south, in Australia, the National University (ANU) has programmes, scholarships, workshops and conferences to inform and support its government's policies and "win the hearts and minds" of overseas scholars from countries in which Australia has a special interest. Fiji has moved up this list in recent years. It is largely thanks to ANU that we have heard the opinions of ANU academics, Jonathon Fraenkel and Brij Lal, both vociferous opponents of the Bainimarama government. It was ANU that gave former Fiji Land Force commander Jone Baledrokadroka a scholarship to research the military. And it is ANU that has just given former Fiji Times editor-in-chief Netani Rika a scholarship to write up his memoirs. The Australian reports that Rika will "spend time in Canberra writing his account of the almost four years he has spent contesting military government control of the media." Intrigueingly, Rika said: "We were always willing to print both sides of the story. But the censors allowed only one side. In such cases, the paper spiked the stories altogether to spare readers being misled." I have little doubt he truly believes this but an independent, objective content analysis of the paper from 2006 on (and before for that matter) would, in my opinion, show most definitely that if both sides were printed, they were never printed equally. I stand by my crude assessment of a 3.5:1 ratio of opposition to government. Content analysis is a research method where qualitative data are measured and quantified, in this case by categorising the frequency, placement, coverage, extent and "bias" of newspaper headings and articles. Regarding Netani Rika's move from Fiji to ANU. It is of course pure mythology that universities are or have been ivory towers, if that means unconnected with countries' political economies. This is especially the case where universities see themselves central to the formulation and implementation of government policies, as most do. However, universities are also often complex and diverse institutions: it is not often the case that a homogeneous or monolithic "line" appears over a whole institution. One part of a university may take one direction, and in the case of the military regime and Australian policy toward Fiji become almost blinkered in pursuing that line, while other academics and parts of the institution take other positions on the same question. Especially where students are post-graduates with considerable employment experience and may even be on leave from important jobs in their home countries, it is unlikely that they will be too greatly influenced by academics who try to sell 'a correct line' against the students' own experiences and views. As a senior ni-Vanuatu public servant, enrolled in a class in another part of the ANU than that where Netani Rika is to be lodged, said just last year: "I will always be grateful to AusAID, the Australian government and people for the education I am receiving at ANU. However I am also a Melanesian and my loyalties lie back home. We don't agree with Australia and New Zealand on Fiji and the support I have received from AusAID does not change that." Who knows - Rika's views may even become better informed by contact with a more diverse range of views as are held by other South Pacific people at ANU, of whom there are quite a few who don't agree with Australian policy either. If not, he is unlikely to influence anyone other than those who already concur with him. As for the "old" Fiji Times from the late 1990s, including when Rika was working there, it was largely just "fish and chips" wrapping paper. Dr Scott MacWilliam lectures on development policy in the Crawford School of Economics and Government in ANU and was formerly at the University of the South Pacific. Pictured: Netani Rika (centre) with forner colleagues at the Fiji Times. Photo: FT. Check out the views on Pacific Scoop of former New Zealand diplomat Gerald McGhie, who is now an independent commentator and who says essentially that Australia and New Zealand should keep a low profile on Fiji and leave it to other Pacific countries to resolve the impasse - their way. 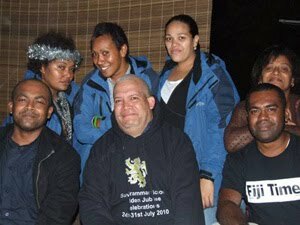 AS A riposte to the armchair media freedom critics from afar in Australia and New Zealand, safely beyond the regime's attention and the tentacles of the media decree, new Fiji Times editor Fred Wesley has penned this editorial. 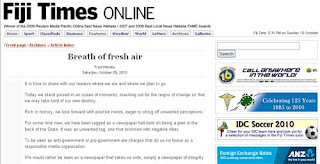 The editorial, headlined BREATH OF FRESH AIR, was published yesterday. It is time to share with our readers where we are and where we plan to go. Today we stand poised in an ocean of moments, reaching out for the reigns of change so that we may take hold of our own destiny. Rich in history, we look forward with positive minds, eager to shrug off unwanted perceptions. For some time now, we have been tagged as a newspaper hell-bent on being a pain in the back of the State. It was an unwanted tag, one that brimmed with negative vibes. To be seen as anti-government or pro-government are charges that do us no favour as a responsible media organisation. We would rather be seen as a newspaper that takes no side; simply a newspaper of integrity. Integrity is regarded as the quality of having an intuitive sense of honesty and truthfulness. Further, it is the opposite of hypocrisy. We are not a newspaper hell-bent on hurting a government. Our passion is to ensure our readers know we have a sense of fairness about us. Our charter is to strive for accuracy and balance with the intention to do justice to every story we print and picture we use. We are not anti-government and we are not pro-government. We are very, very pro-Fiji and living proof of this is our 141-year record as recorders of history in this nation. In short, we are The Fiji Times, neutral and striving to ensure any perception that paints us otherwise is easily washed off. We will endeavour to make sure our readers see in us a newspaper that is easy to read, has entertaining and educational information and pictures, plus believability and authority. For the past few months this newspaper has worked under a cloud with the possibility that the unthinkable could happen - Fiji without The Fiji Times. We are now proudly owned in Fiji and our good people are once again doing their best with heads held high. Together we can do good for this country and we hope to live up to the image that has etched indelible marks on the minds of hundreds of thousands of readers over the past 141 years of our existence. We are about people, values, honesty, commitment, perseverance and unity which is to say 'One People, One Nation'. There comes a time when change is inevitable. It is a breath of fresh air and we are open to new ideas that will ensure we have a place in the lives of every citizen in our beautiful country. Sleep assured we are firmly committed to helping our country move forward. Today is the beginning of a new path for The Fiji Times. Today begins the work to be rid of any unwanted perceptions. 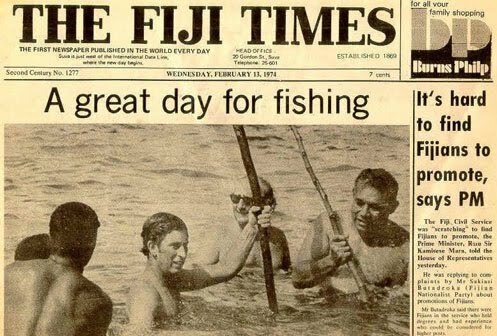 Today is about ensuring the slogan "Fiji without The Fiji Times is unthinkable" is carved deeply in the hearts and minds of all our readers. Today, we give you a newspaper that is fair, just, balanced and honest. Today we give you a newspaper that holds true to the ideals of good journalism. 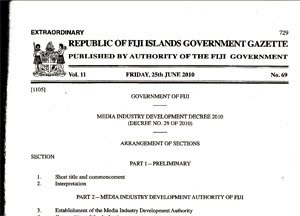 Pictured: The Fiji Times editorial and page one of the Fiji Media Industry Development Decree 2010. THE DOOMSDAY brigade is quickly at it again with its tenacious state gagging scenario at the Fiji Times. Media voices trot out the same tired old media freedom clichés about the fate of the ex-News Ltd newspaper that did so much to dig its own grave. Café Pacific prefers to keep an open mind and see what Motibhai’s new publisher, Dallas Swinstead, can produce. Give him time. A breath of fresh air and a strategic rethink of how to go about being an effective newspaper faced with the reality of a military-backed authoritarian regime. A real challenge. Murdoch's previous News Ltd managers at the FT failed to get to grips with reality in Fiji. The combination of ownership by a Fiji company headed by astute businessman "Mac" Patel, who had long experience at the newspaper as a director, and a trusted publisher, who already had a track record as an innovative chief executive at the helm for four years – albeit during more relaxed times – could yet turn out to be a winner. And if the Fiji Times succeeds in negotiating the media decree minefield and staying afloat with its long-lost integrity restored, then chalk that up as a media freedom success. If the newspaper learns from its past divisive mistakes, then even better. This outcome is vastly preferable to the News Ltd debacle that brought the newspaper to the brink of closure. Netani Rika and Margaret Wise are synonymous with that partisan era of questionable ethics. Rika "sacrificed" his job for the good of the company. But the rot had actually set in long before the George Speight attempted coup in May 2000. The International Federation of Journalists voiced concern for the future of “critical and independent media” in Fiji, with secretary-general Aidan White saying: “The regime-imposed pressures on the Fiji Times risk silencing anyone who dares to stand up to defend independent media for the people of Fiji.” The Pacific Freedom Forum is concerned about “increasing confusion” as spin and silence reigns with a new Fiji clampdown. The regime friendly rival Fiji Sun reported the Fiji Times newsroom in a turmoil. Veteran columnist Seona Smiles says the resignation of Rika and the uncertainty over deputy editor Sophie Foster is a “great loss” to the newspaper. For people to have to leave a job that they are both competent at, for political reasons, is always difficult. And both Netani Rika and Sophie Foster remained very staunch and true to journalistic ethics, throughout the recent period of political crisis. He is likely to take a more diplomatic approach to the regime than his immediate predecessors. But I certainly don’t think he is going to be kowtowing to the regime. He has made some quite strong comments since he has been appointed. Yes, we are changing direction. Having watched News Ltd perish in this country, there’s no sense in committing suicide – even with a local-owned replacement. There is no doubt that The Fiji Times cannot be antagonistic to the government. What on earth does it prove? But we will ask questions in a fair and balanced way because we will be helping to bring the people to the government. Pacific 'dictatorship of the publishitariat'? SPEAKING at the 2010 Pacific Islands Media Association (PIMA) conference in Auckland on Friday, the keynote speaker, well known and respected Tongan media publisher and media freedom activist 'Eakalafi Moala said: "Press freedom in the Pacific Islands is under constant threat" while "New Zealand journalists ... took freedom of the press for granted." Taken at face value, most would agree. But I wonder. Is it as straightforward as this? In an ideal world, would press freedom always prevail? Or, to play devil's advocate, should it ever prevail? What, exactly, is media freedom? Can a case be made that restrictions should be placed on the media in some situations? What are those situations? 'Eakalafi talked of cultural constraints in the Pacific but are there no cultural or other constraints in Western societies? How free, really, is the New Zealand media? Does it truly provide access to information the people need to know? Who decides what we will read and hear and how it is presented? Who decides the news? I'm reluctant to write about Fiji again in this context, but when did the NZ media last report a contrary view on the situation there? How have they helped to explain what is happening, and why? How do they decide who to interview? Do they ever verify their stories? One can also ask what is meant by information when so much of what we see is sensationalism and trivia. What real balance exists in their coverage? Even media people ask what's happened to investigative journalism. We've never before had so much access to information, but we've also never has access to so much wrong or useless information. Sometimes I ask, do I know more about any matter of consequence because of the media, or am I merely more misinformed? And then I ask myself about the supposed role of the media in a democracy and what it actually does. Who really is this freedom for? I am not an advertiser or a shareholder in the media. I don't vote for their boards or sit on their appointment committees. I have no say whatsoever in what they choose to publish or not to publish. I am not part of the media or any other establishment. I cannot vote them out with a letter to the editor or an appeal to the Broadcasting Standards Authority. When it comes down to the hard questions, we should ask how significantly different are the NZ and Pacific media? Different masters, different circumstances and different stories, but I suspect that whoever pays the piper still calls the tune. My only freedom is the choice to switch off the TV and radio and not read the newspapers. Sometimes, not always of course, I wonder how they dare claim a special, elevated place -- the Fourth Estate -- in a democracy when their power is more akin to a "dictatorship of the publishitariat." Freedom of the media, by the media, for the media? An overstatement, perhaps. But by how much? Fiji Times' editor going, going ... gone?